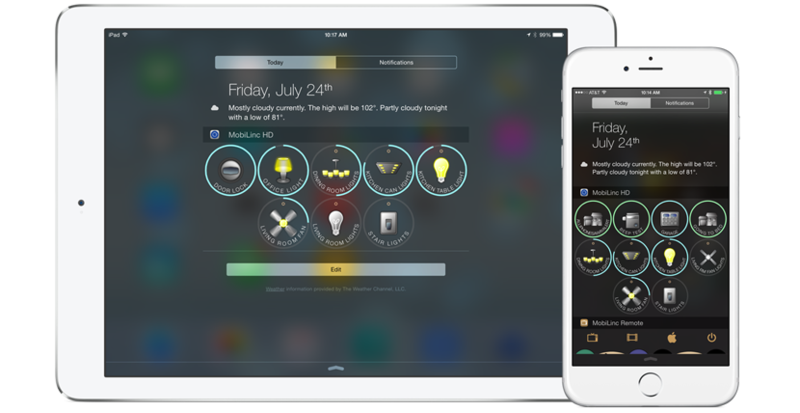 With your iOS device, MobiLinc, and the Extended Screens plug-in, control your lights, devices, scenes, and programs right from your Apple Watch and the Today View! See the real-time status and command your most used devices, scenes, and programs right from your Apple Watch and Today View. Supports all your ISYs connected to MobiLinc Connect or via a direct IP address on one aggregated view. Apple Watch and Widgets supported on all iOS 11+ devices running MobiLinc HD, MobiLinc Pro, and Orchestrated MobiLinc connected via MobiLinc Connect or direct IP. 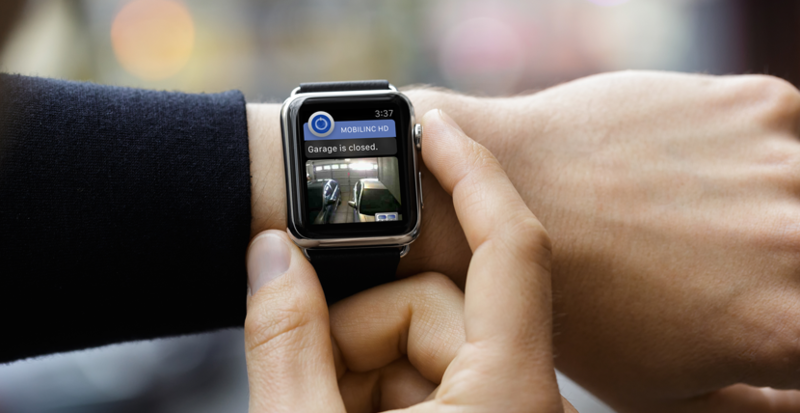 Supports dynamic notifications on the Apple Watch: If a notification is triggered by a device status change and that device is associated with an IP Camera, MobiLinc will attempt to show the current image of your IP Camera in the Apple Watch notification. 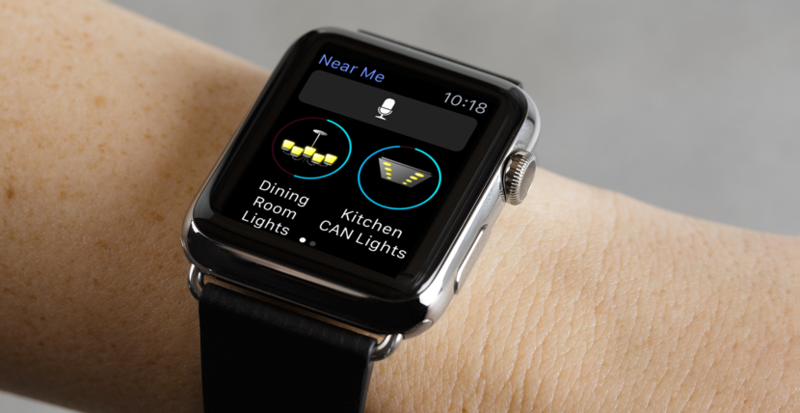 Use the mic on the MobiLinc Apple Watch app to dictate your voice commands using Siri. See the Voice Control plug-in for details. *MobiLinc Connect users still get access to the Today View included as part of the MobiLinc Connect subscription for free! An ISY series controller is required. If you have an ISY and would like to try MobiLinc Connect free for 30 days, open MobiLinc and go to Settings->Lighting Controller->Host Type and select "MobiLinc Connect"
Select "Create a New Account" and follow the directions. Or if you are connecting to your ISY via a direct IP, the Extended Screens plug-in fully supports this as well. - Open the Apple Watch app on your iPhone. - Find MobiLinc and toggle it to install. - Confirm MobiLinc is now installed on your Apple Watch. - Open MobiLinc on your iPhone and go to Plug-Ins to purchase or restore the Extended Screens plug-in. - Open MobiLinc on your Apple Watch and confirm that the app opens and is ready for you to select devices, scenes, and programs to add to Apple Watch. To configure, select your device or scene under Devices or Scenes and scroll to the bottom and select "Extended Screens". Then, tap "Always on Today View" or "Always on Apple Watch". To configure a program go to Programs and select your program. Scroll down and select "Extended Screens". Then, tap "Always on Today View" or "Always on Apple Watch" and select which part of the program you would like to run when the program widget is tapped. - Drag the Today View down from the top of the iOS device. - Scroll to the bottom of the Today View and select "Edit"
- Under "DO NOT INCLUDE" find and select the MobiLinc Widget to add it to your Today View. MobiLinc's Apple Watch and Today View widget is available to for all ISY users with a direct IP or an active MobiLinc Connect subscription running MobiLinc HD, MobiLinc Pro, or Orchestrated MobiLinc on Apple iPhone/iPad iOS 12+ devices. Q: "How do I see my IP Camera on the MobiLinc notification?" 1. In MobiLinc, go to the details of the device or program that is configured for notification(s). 3. Select "Associate With IP Cameras"
4. Select the camera to associate the item. 1. If more than one camera is selected, only the first camera when sorted A-Z will be used. 2. When the device or program notification arrives on the iPhone, the iPhone decides where to show the notification. If the iPhone's screen is off and the Apple Watch is on your wrist and unlocked, the iPhone will most likely show the notification on your Apple Watch. 3. This is a best-attempt feature. The Apple Watch only allows about 8-10 seconds for the MobiLinc app to connect to the camera and pull down the latest image. On Wi-Fi this is quite reliable. Over a cell connection, this will take longer depending on the connection speed. If it takes more than 8-10 seconds, the Apple Watch will only show the basic notification. 4. To best prepare your IP Camera for use with dynamic notifications, make sure that you can view your camera in multi-cam mode in the MobiLinc app while on Wi-Fi and cellular. 5. Device or Program notifications require MobiLinc Connect. For location events such as leaving or arriving to/from a geo-fence or iBeacon that result in issuing a local notification, both MobiLinc Connect and direct IP connections are supported. Q: "The MobiLinc Watch app does not load on Apple Watch or the Today View"
1. On the iPhone, make sure the iOS device is running the latest iOS version and your Apple Watch is running the latest WatchOS. 2. Double-tap the home button and close out of all apps. 3. Remove MobiLinc from the Today View. 4. Remove MobiLinc from the watch. 6. Reboot the Apple Watch. 7. Once the watch and iPhone are rebooted, open the watch app on the iPhone and reinstall MobiLinc but do not open the MobiLinc app once installed. 8. Once the installation is completed, open MobiLinc and go to Plug-Ins and tap "Restore". 9. Select the Extended Screens plug-in and purchase again. iTunes will not charge you a second time. 10. Once the restore and "purchase" completes successfully, open MobiLinc on the Watch and verify that it starts up. 11. Add MobiLinc back to the Today View and verify that iOS loads the MobiLinc widget. If iOS is still unable to load MobiLinc on the Apple Watch or Today View, please try deleting MobiLinc and reinstall from the App Store. Q: "How do I hide or show the mic button on MobiLinc for Apple Watch?" A: Force press the screen to hide or show the mic/voice recognition button.